Bassist Krist Novoselic from Nirvana recalled that 'In bloom' 'originally sounded like a Bad Brains song. Then Kurt turned it into a pop song'. 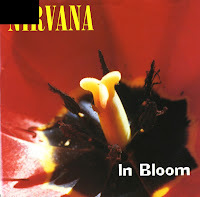 The band recorded a demo of 'In bloom' with producer Butch Vig at Smart Studios in Madison, Wisconsin in April 1990. The song originally had a bridge section that Vig removed. Novoselic said that after the band recorded the song, Vig cut out the bridge from the 16-track master tape with a razor blade and threw it in the garbage. After signing to DGC Records, Nirvana began recording its second album 'Nevermind' in May 1991. 'In bloom' was one of the first songs the band recorded during these album sessions. The arrangements for 'In bloom' and the other songs previously recorded with Vig in 1990 were largely unchanged; the recently hired drummer Dave Grohl stayed mostly with what his predecessor Chad Channing had recorded, but added more power and precision to the recording. 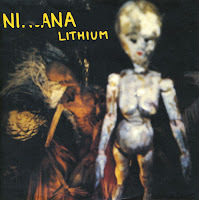 Nirvana frontman Kurt Cobain described 'Lithium' as 'one of those songs I actually did finish while trying to write it instead of taking pieces of my poetry and other things'. He added that the sog is about a man who, after the death of his girlfriend, turns to religion 'as a last resort to keep himself alive. To keep him from suicide. I did infuse some of my personal experiences, like breaking up with girlfriends and having bad relationships'. The song was originally recorded in April 1990 with Butch Vig producing. It appeared as a track on their debut album 'Nevermind' and released as a single from the album. It reached number 11 in the UK singles chart and number 16 in the Dutch Top 40. It wasn't until 'Weird Al' Yankovic released 'Smells like Nirvana' that I became interested in Nirvana's 'Smells like teen spirit'. When it was released, I just thought it was a lot of noise - infernal racket to be precise - and I didn't want to listen to it at all. Tori Amos also made a very beautiful ballad version of this song, and so in the end I had to concede there was some merit to this track after all. 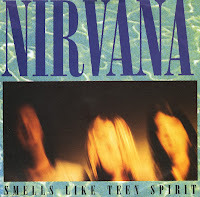 'Smells like teen spirit' can be considered as the one single that introduced the world to the Seatlle grunge scene. Ironically, Kurt Cobain commented about the song: 'I was trying to write the ultimate pop song. I was basically trying to rip off the Pixies. (...) We used their sense of dynamics, being soft and quiet and then loud and hard.' The single reached number 6 in the US Billboard Hot 100 chart, number 7 in the UK singles chart and number 3 in the Dutch Top 40.